Maxon Motor Australia offer EPOS (Easy to use Positioning System), which is a second generation family of intelligent positioning controllers. The EPOS2 positioning controller is a digital positioning controller designed to control brush and brushless DC motors with encoder. Maxon Motor Australia EPOS positioning controllers are suitable for applications that require decentralised drive intelligence. These modular digital positioning controllers, based on CANopen standard, cover a performance range from 1 to 700 watts. The EPOS positioning controllers can operate in position, speed and current control modes, and can be configured to operate with both DC and EC motors, depending on software commands. A variety of operating modes allow the EPOS positioning controller to be used flexibly in every kind of drive systems in automation technology and mechatronics. The new EPOS2 positioning controller features 32-bit digital signal processor technology which supports the best motion control functionalities. Complex mathematical algorithms can be carried out efficiently using the EPOS2 positioning controller, producing better control characteristics. The new EPOS2 positioning controller offers better security and effective protection against electromagnetic interference caused by potential-separated digital inputs and outputs. With the interpolated position mode (IPM), the EPOS2 positioning controller is able to synchronously run a path specified through dynamic and accurate interpolation points. With a suitable master, coordinated multi-axis movements and any profile can be carried out in a 1-axis system. The regulation tuning functionality is an effective and time-saving tool for adjusting power, speed or position control. It simplifies set-up of the new EPOS2 positioning controller. Online commanding is carried out using the CAN Master (EPOS P, SPS, and Soft SPS) or PC through USB or RS232 interface. A USB to CAN and RS232 to CAN gateway function has also been integrated. 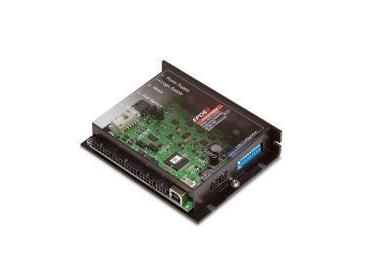 Several drives can be networked and coordinated through the standardised CANopen interface. The compact design of the new EPOS2 50/5 positioning controller enables it to be used in areas such as tool building, production machinery, automation tasks and in places requiring decentralised drive intelligence.